Hello friends! 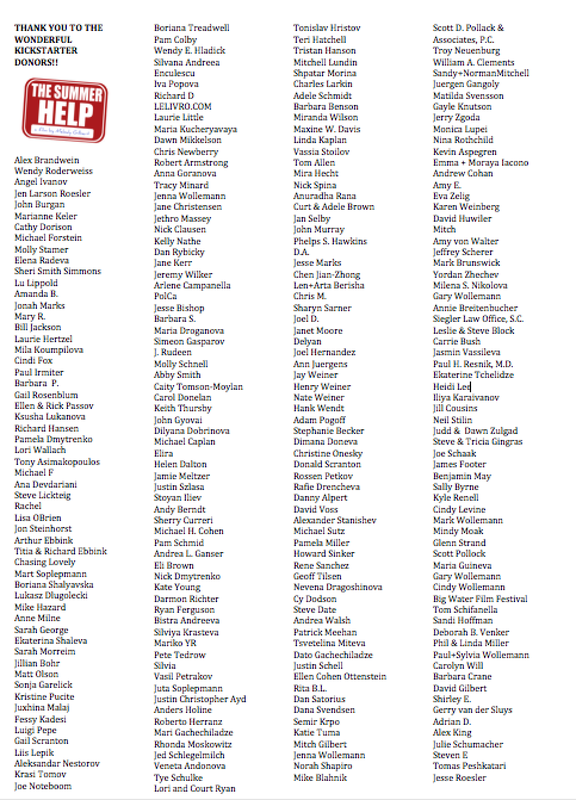 Here is a list of all of the 250 amazing and wonderful donors who donated to “The Summer Help” Kickstarter campaign. What a roller coaster ride it was, but we made the goal with 7 hours to go and we are now officially 101% funded. Thanks to all these lovely people, we will be able to finish the film in the next few months! This is a screen grab from the Kickstarter campaign when we just seconds after we reached our goal. That was an incredibly exciting moment and I am thrilled with the support and Kickstarter love 🙂 . A special shout out to Dumitrita Pacicovschi for her amazing social media support during the Kickstarter campaign (and for everything else she does). She is the best associate producer I could ever ask for. Watch for more updates here in the weeks to come. Now it’s time to focus on finishing up the film and premiering it in 2016! I’m so glad that the funding has come in and that NuBoyana is making its fabulous resources available. i can’t wait to see the “The Summer Help” and hope Washington, DC will be on the list for distribution. Congratulations on the big step forward to the final film! Hi Risa! “The Summer Help” is now available for public viewing through Kanopy for free. More here: https://thesummerhelp.com/2018/10/02/the-summer-help-now-available-online/ Happy viewing!